Manchester United fans are, at the moment, living in a world without worries, as their team has won 5 games on the trot in all competitions. The mood around Old Trafford is nothing but joyous and optimistic. Ever since the sacking of Jose Mourinho and Ole Gunnar Solskjaer’s arrival, freedom and boldness are what the club has been preaching. United now face their biggest test under Ole, as they travel to Wembley tonight to take on a top side in the form of Tottenham Hotspur. Pochettino is a man that has been heavily linked with the managerial role at Old Trafford, and the Red Devils will be keen to clinch the 3 points and lessen the weight of that rumour. There is, however, another headache for Solskjaer to think about, as according to new reports coming in from Sky Sports, Gareth Southgate is being considered for the role of permanent manager of Manchester United. Southgate had a World Cup run to remember with the Three Lions, and receiving an OBE for the same added value to an unforgettable year. 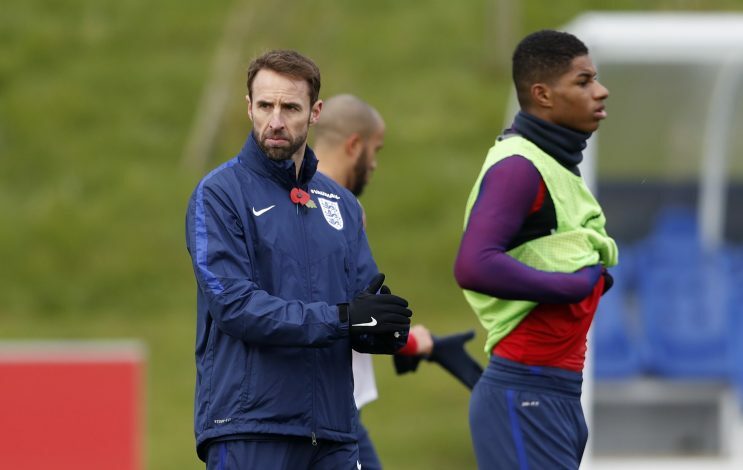 While the FA has not been official contacted by the club, the fact that the England boss is brilliant with youth promotion, plays fearless football, and has a mentality to approach each game to win makes him a genuine contender for the position at Old Trafford. But when it comes down to the hard truth, England did come back from the World Cup without any medals and trophies to their name. Moreover, if Ole and his side do manage to pull off a brilliant win at Wembley tonight, the fans will much rather prefer to see their very own legend get the job full-time.